So began a mash note to the object of my first adult crush, a beautiful hermaphrodite with balls on her head, two of them, side by side—a high-fashion hairdo, no doubt, back in 8th-century Korea where she was born. She occupies the place of honor in the main hall of an ancient Japanese convent, the Chûgûji, attached to the famous Hôryûji temple outside Nara. She lounges on her pedestal in a relaxed half-lotus position, reaching her right hand toward her chin, her extended middle finger almost touching her cheek. Her faint smile hints of something wonderful to come. The folds of her robe ripple around the T-shaped intersection of crossed leg and knee like sand dunes formed by alternating winds. I knew that, in all likelihood, she had been built around a wooden frame, and the sculpted wood was probably as thin and hollow as a cicada’s shell. But being an inveterate tree-hugger, I preferred to imagine that she had been carved from a single block of wood, that the sculptor had lifted her with a few strokes of his chisel from the heartwood of some mighty cypress. Even as she sits eternally poised a half-second away from some earth-shaking realization, somewhere back behind her navel, concentric rings might still mark the spot where the tip of the original sprout once unfurled. After the first two or three centuries of intense borrowing from China, a native Japanese aestheticism slowly took root. The wooden temples and sculptures, once painted in the bright colors that the Chinese have always considered auspicious, were allowed to fade and weather; the resulting patina and play of shadows became highly prized. Some thousand-year-old sculptures, if stored properly, can still retain traces of color. 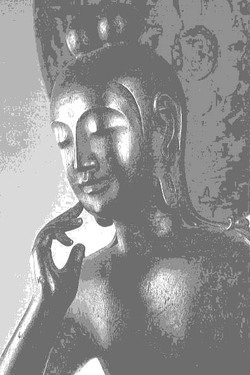 But this one—believed by most scholars to represent Miroku, or Maitreya in Sanskrit—wore a shiny coat of black lacquer. It couldn’t have been too many centuries since she was last retouched. The first time I saw her, glistening in the natural light filtered through rice-paper windows, she took my breath away. The downward gaze suggested not submissiveness, but the opposite: a great power to transform, held in reserve. Behind her, attached somehow to the back of her head, rose a large nimbus with miniature embossed buddhas floating in full lotus position around a ring of flowers and a central, open blossom. In contrast to the main figure, it was stained in various shades of faded red. Since Miroku is the Coming Buddha—virtually a Buddhist Messiah—the halo took on a special significance for me. I figured it was meant to represent Miroku’s own vision of a future buddhaverse, presently gestating somewhere in the otherwise still waters of samadhi. If it didn’t make her sound too cartoonish, one could say that this halo functions as an 8th-century thought-balloon—the kind with a light bulb in it. But perhaps a better comparison might be with a soap bubble. Indeed, her upraised hand looks very much as if it might once have held a small wand with a loop of bamboo at the end for dipping into a bowl of soapy water, and her smile signals just the right hint of bemusement. In imagination I sit again on the hard tatami mats, gazing up worshipfully when I should be meditating on earthly transience, my nostrils prickling once more with the smell of sandalwood. I’m waiting for a perfect sphere of her breath to float down in front of me like a fishing lure, its fragile container glistening with the five parts of light. please don’t give my salvation a second thought. Written by Dave Bonta of Via Negativa. I don’t think I’ll ever be able to see another representation of Maitreya without envisioning him/her blowing a soap bubble. That’s exactly the quality the most wonderful representations convey — a devout concentration on making something very delicate and fragile, backed with the conviction that it’s only ever completely and always play. I love the idea of a mash note to a buddha! Glorious. “Five parts of light” I like very much. Would they be the “five” colors of the rainbow? Or is there more than has met my mind? Very apropos of qarrtsiluni. What is it that I am waiting for to burst? Me? I hope I have all the “five parts”. Dale – I like the way you put that. Devout play. Yes. Bill – Five because the surface of a soap bubble breaks light down into the colors of the rainbow, yes. Though in the last few seconds of its existence, should it last that long, the film thins out until it’s less than the average wavelength of visible light, and it loses this property, as I’m sure you’ve noticed. The word qarrtsiluni is certainly mysterious; that’s what we liked about it. As I understand it, one sits in the communal darkness waiting for the germs of songs to burst through the surface of consciousness, sacred hunting songs to be used for the great whale. Inevitably I think of Jonah in the belly of the fish. “The downward gaze suggested not submissiveness, but the opposite” — great observation. I love the play aspect, too — and the transformative power it wields simply by being.